Last week I contrasted the Samsung CB2 13” with my stable of Chromebooks and my Chromebox. I purchased a couple of additional Chromebooks for our Intern Hackathon prizes. I took the opportunity to try the units and get some impressions fresh off of the other review. I think this allowed me to quickly and efficiently evaluate the units. The prizes I purchased were the HP 11 and a Samsung CB2 11”. Regarding the HP, I assumed that because I was 6 months removed from the original HP, and the unit was being restocked, that this would be considered the “Revised” HP 11. It turns out there is a new version coming soon that most people have tagged with that moniker and the current model is considered the original. With that in mind, let’s first compare the two Samsung models. Materials are simply much better on the 11 with a couple of exceptions. The lid is soft touch plastic, the rest of the chassis is just a little nicer. The 11 just looks better. The material used on the touchpad is the primary enhancement for the 13. The gray of the 13 is unappealing while the black of the 11 looks really rich and sharp. As stated in the last review, it seems counter-intuitive that the smaller, less-expensive unit would have superior construction, but that is the case here. The 11 is not as bright as the 13, and the color temp of the panel is a lot warmer. The viewing angles are similar(possibly slightly better on the 11). The panel on the 11 is nice for its size, but when using 1366×768 vs. 1920×1080, resolution is the clear winner. Windows are not usable side by side on the 11 like they are on the 13. In comparison to the touchpad on the 13, the 11 feels a little irritating. The touchpad on the 13 is smooth like glass, but it is not cool to the touch. The layout of the two keyboards are almost identical, but the pressure and depth of movement required is superior on the 13. Touch-typing is the automatic experience it should be, not a process that requires corrections and attention. Can the HP and Samsung 11 compare with the Dell 11? I keep having iMac flashbacks to the 1990s looking at the HP. Did they hire a designer from that old team? This sure feels like one of the old clamshells from Apple. The HP chassis is different from most others, and depending on your preference you will likely either love or hate it. 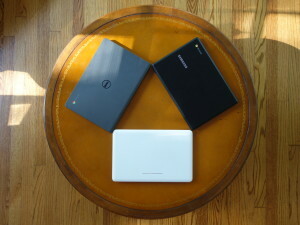 The HP and the Samsung are distinctly thinner and lighter than the Dell, which is a clear advantage. That said, the Dell is still better made in my opinion. The materials Dell uses are top notch for this price point, I am still amazed with the soft touch plastic around the keyboard. I do like some of the extra design touches on the HP. As a Pixel owner, I appreciate the LED strip on the lid of the HP. I am disappointed other manufacturers have not taken this up as a “standard” feature. It seems to me it could be quite useful for notification, customization, and entertainment purposes. The color around the keyboard is fun. I never really mind a little whimsy on the inside of my devices, just keep the outside clean. I also love the use of micro usb for charging. This is a fantastic idea and I really wish more manufacturers would give this a try. Overnight charging with the rest of my devices on a multi USB station would be a wonderful change from toting a proprietary brick around. Chassis quality is distinctly different between all three units. Samsung is attempting to be sophisticated while HP is well, HPish. I have a clear preference for the Dell first, the Samsung second, and the HP third. This HP still comes with an IPS panel despite the rumors otherwise (this may change in the near future but to my knowledge has not yet). I would not be shocked if a TN panel started shipping but it certainly was not in the model I received last week. With that in mind, you will not be surprised to find the the HP has the best screen of the group. Colors, brightness and viewing angles are all better than any Chromebook I have used except the Pixel. I will say that I like the design of the hinge on the Dell better than the others. The screen sits higher and that is simply more comfortable when typing. The HP sits extremely low. This allows the unit to be smaller, but is less than ideal for heavy typing ergonomics. The Samsung is a step better but not as nice as the Dell. The HP is also dull in the audio department. The Samsung is markedly better than that, but the Dell is again the clear winner. Movie trailers were far deeper and louder. There was no buzzing in the unit even at full volume. The Samsung is still quite good but I would suggest the HP would simply not work in a moderately loud environment and is only suited for use by a couple of people. The Dell, in contrast, will fill out a small room nicely if watching a movie, listening to music, or participating in a Hangout. I would not be surprised to find that HP and Dell used the exact same touchpad. They are not quite as nice as the Samsung CB2 11 but quite acceptable. It is very interesting to me that I can easily tell that the pad on the CB2 13 is a step above the CB2 11 which is a step above the Dell and HP. The Dell keyboard is the clear winner here. The others are good but feel a little cheap next to the Dell. The keyboard is also less audibly “clicky” on the Dell than the Samsung, while the HP feels dull and more like it knows it will break soon. There is not a lot of debate in my mind on the input devices. I use touchpads and island style keyboards on all of my devices. The long-term usability of a particular piece of hardware is obvious in a few minutes. The Dell is the fastest machine. As mentioned in my previous review, the CB2 is not obviously slower unless you are using the machines side by side. The HP11 is faster in daily use than the original Samsung ARM Chromebook but is clearly slower than the other two in this comparison. I systematically opened the same 13 memory intensive sites on the three machines. I then went back and played HD trailers on all three machines. This really stressed them and I was pleased with the separation it provided me to evaluate the units. I was also able to determine that none of them run very hot under load but the HP did get a little warmer than the others. As a secondary machine all of these will work just fine. For a daily driver I would have to eliminate the HP, the processor is too weak for 2014. I can excuse the first gen Sammy for being a bit slow after years of production, but no excuse for a brand new device. I am undecided as to the real risk of choosing the HP11 or even the original Samsung ARM CB. On one hand, Chrome has improved its efficiency dramatically this last year and the gains are obvious on such a device. On the other hand, Android apps are coming to CBs and it seems that many of those will tax the processors extensively, especially the games. It is possible that a year from now we will all be wishing for higher powered cpus, but we might not be. I am curious to see where this all goes. 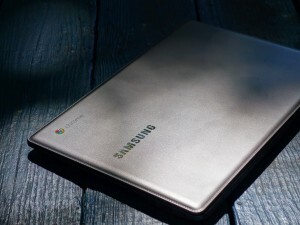 ..as long as I do not have the 13” CB2, that has become my go-to machine and the best Chromebook for the dollar. 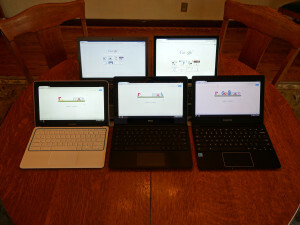 My ultimate conclusion is the the 11’ chromebooks are, as a group, a toy to me now. They remind me of a 7” tablet. They are good to use, very functional, but never my first choice. The 13’ with a 1920×1080 screen I predict will be the sweet spot for CBs just like they are for laptops. Perfect resolution for multitasking, lightweight, slim, and less than $400, that is a sweet package.